At one point in my cooking life, I could not have told you the difference between EVOO and any other cooking oil. Now? I’ve always got two bottles on hand. Like coffee, it can become cataclysmic around here if we run out. Cauliflower rice is its perfect pairing, and much kinder on the waistline than the heaping pile of Uncle Ben’s I ate with this dish once upon a long time ago. Lastly, major props to Amy Roskelley and Natalie Monson, the two-team genius behind SuperHealthyKids.com. Their homemade cream of mushroom soup was a cinch to make, and I ate it without worrying about other “ingredients” like modified food starch, monosodium glutamate, soy protein concentrate, etc. Fresh and fabulous. Dish it up with a side of Roasted Squash and enjoy! Homemade cream of mushroom soup (courtesy Super Healthy Kids). Melt butter in a saucepan over medium-low heat. Whisk in flour (1 tablespoon for cream of chicken, 2 for cream of mushroom or for extra thick cream of chicken). Continue whisking until the mixture is smooth and bubbly, making a roux. Remove the saucepan from heat and slowly add in chicken broth and milk, whisking continuously. Whisk until combined, then return to the heat. Bring to a gentle boil and simmer for 5-10 minutes, until thickened. Mixture will continue to thicken as it cools. Salt and pepper to taste. Brown chicken in olive oil over medium high heat. Sprinkle with sea salt and fresh ground pepper. Add rosemary, thyme, and garlic powder. Add cream of mushroom soup and half & half. Cover and simmer on low for 30 minutes. Enjoy gravy over Cascadian Farm Cauliflower Rice, with a side of Roasted Squash. 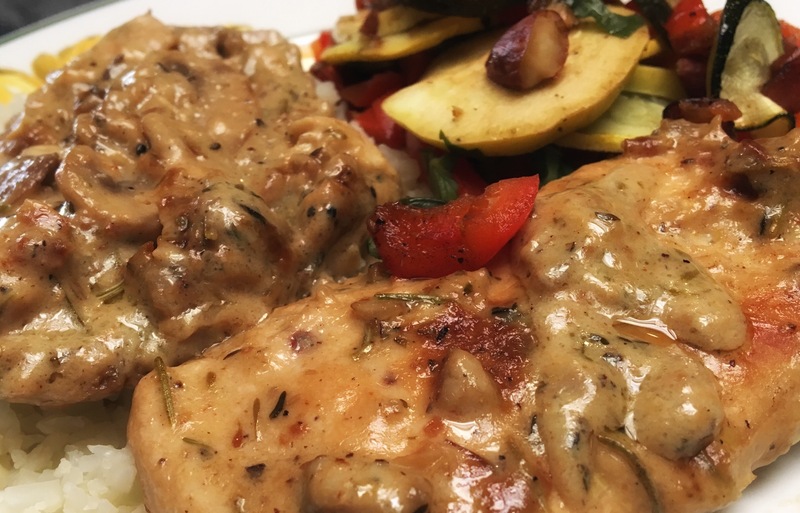 MFP entry: Chicken Magnifique, one 3 oz portion chicken with 1 cup mushroom gravy, Chicken Magnifique, 340 cals.